You have seen it one moment and then it's gone! Ladies and gentlemen, I give you the magical Mr. Mistoffelees! 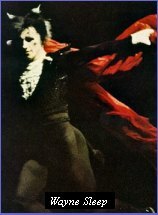 Wayne Sleep originated the role in London in 1981. Timothy Scott was the first to play Mistoffelees on Broadway. Tragically, he died of AIDS in 1988. Jacob Brent is in the video and he played the role on Broadway through the end of 1999 . If anyone has a photo of Don Johanson as Mistoffelees, please email me at Don was the Misto I saw at the Winter Garden Theater in NY in 1987 and I'd love to add his photo to this page. Cats the musical & cast photos © copyright The Really Useful Group Ltd.